The life of Go Eun Chan (Yoon Eun Hye) is not easy; she works many jobs to pay off debts and even gave up her feminine image. Choi Han Kyul (Gong Yoo) is the heir of a big food company, but his grandmother wants him to settle down, so she arranged many dates for him. After Eun Chan bumped into Han Kyul and was mistaken for a boy, Han Kyul decided to hire Eun Chan to be his gay lover in order to avoid the arranged dates. Desperately in need of money, Eun Chan had no choice but to accept. Han Kyul’s grandmother also made Han Kyul in charge of a filthy coffee shop in danger of being bankrupt. Eun Chan begged to work at the coffee shop, and not long after, feelings start to spark, except, how would Han Kyul accept his “homosexuality”? This entry was posted on Sunday, August 21st, 2011 at 7:45 AM	and tagged with chae jung ahn, gong yoo, lee sun gyun, yoon eun hye and posted in 720p, Drama, Highly Recommended. You can follow any responses to this entry through the RSS 2.0 feed. wow, u beat me 🙂 축하해요. 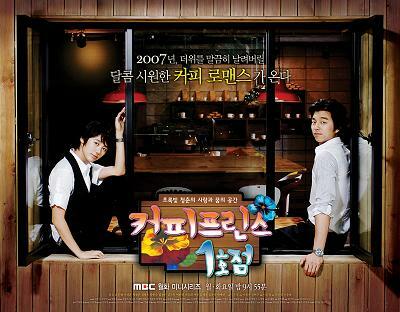 Coffee Prince still the best up to now. do u realize that somehow drama after CP using CP as their reference? like Personal Taste which has similar concept and male dress code. I’m first…thanks styrn…my favorite drama of all time…YEH is the best!!! hari ini memperingati 3 tahun meninggalnya Lee Un…Lee Un Rest In Peace! !